Kristian Bezuidenhout performs Beethoven’s Piano Concerto No. 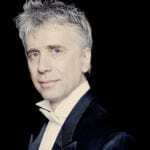 2 with the Kammerorchester Basel, conducted by Giovanni Antonini. Filmed at the Menuhin Festival on 2 Sep 2016.